Rewatched Old Boy by Park Chan-Wook, it being one of my favorite films. Having known the plot beforehand, and this being the first time I’m watching it in years (watched the horrible remake of it about a while back, which probably prompted me to watch the original one this time round), I was able to see things from a fresh perspective and notice things I didn’t before. Among the many things that impressed me was the long shot of the protagonist (aka “Monster”, played by the amazing Choi Min-Sik) against a gang of triad members. 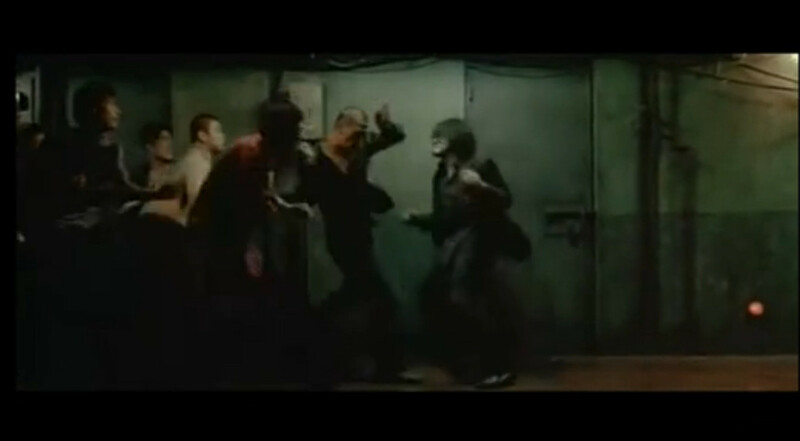 Choi, aka “Monster”, up against dozens of gangsters in this famous fight scene. Through this long shot, where the camera pans from left to right and back, the opponents launch at Choi from all angles, using different weapons and at different speeds, almost like you can imagine happens in a real life fight. And Choi dodges and counters, and sometimes fails to dodge and is hit from the sides and back. More than once, Choi falls—and is immediately surrounded by his opponents who jump on him ruthlessly. Immediately, though, he would climb back up to retaliate and gain the upper hand. All these, a full two and a half minutes worth of fighting scene, was shot without a single cut. In short, this entire scene is choreographed down to the finest details and rehearsed over and over again until that one shot is perfect. It must have taken hundreds of retakes in order for the flow, the rhythm, the angles, the realism to come off right. There are so many other things that can be said about this film, but there’s another one that I’d like to highligh, namely the “flashback” scene when Choi was trying to remember what he saw and shouldn’t have seen when he was younger. Whereas the typical flashback scene separates the present and the past into two discrete units, in this case the flashback is beautifully intertwined with the present. As the younger Choi scribbles on the blackboard of their old classroom, so does the present Choi sit in the same classroom, watching him from his seat—the present self and the past self sharing one timespace in memory. As the younger Choi runs up the stairs in pursuit of Woo Jin (the villain), so does the present Choi run up the same stairs, following the former. In short, a beautiful visual presentation of the recollection process, where the present self attempts to catch up with the past. But Old Boy is not just about doing old things in new ways. From the intense music to the surreal backdrop to the stylish cuts and frightening realism (I’m reminded of the tooth extraction scene), there is a strong sense of coherence that ties up the film and earns it its strong reputation as a film. We’ve all seen films where the premise was good, but finally degenerated into an incoherent, disappointing piece. In my view, it’s the attention to details and willingness to go all the way to ensure total artistic uniformity that makes Old Boy such a fine piece. Now that’s a good lesson to be learned.